Welcome to Shred Wise, a mobile shredding company serving commercial and residential clients throughout Stanton, Cypress, and Los Alamitos, CA. Our services include on-site and off-site document destruction, available on a recurring or as-needed basis. By basing our paper shredding services on the industry’s best practices, we help our clients keep their sensitive information private. With nearly ten years of experience, thousands of satisfied clients, a high rate of referrals, and cost-effective prices, businesses and residents in Stanton, Cypress and Los Alamitos can trust that Shred Wise will more than meet all of their paper shredding needs. Document destruction refers to the safe shredding and disposal of sensitive documents. If you’re an individual, proper document destruction helps to protect you from having your identity stolen. If you have a business, document destruction is even more important: It not only contributes to safeguarding the proprietary and sensitive information of your business, employees, and clients, but also helps to ensure your compliance with local, state, and federal privacy laws. Non-compliance with today’s privacy laws not only exposes your business to unnecessary risks, but can also lead to huge fines. For these reasons and more, everyone in Stanton, Cypress & Los Alamitos–from the individual to the small retail shop to the large corporation–stands to benefit from our professional shredding services. drop-off shredding services at our facility in Orange. Mobile shredding services are available Monday through Friday, while drop-off shredding is available seven days a week. If our Cypress clients require ongoing services, we set them up with a simple agreement that locks in their pricing for a year, permits use of our lockable shredding containers for the duration of the agreement, and outlines the frequency of our service calls. 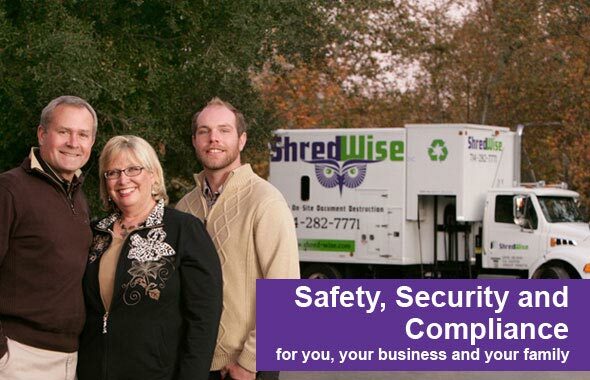 Shred Wise Inc. is a locally based, family-owned and -operated commercial mobile shredding company. We have been serving the paper shredding needs of the local community since 2006, and know how to customize our shredding services to accommodate a wide range of needs, from those who need a one-time purge to those who want ongoing, regularly scheduled service visits. We are licensed, bonded, and insured, and NAID (National Association for Information Destruction) compliant. Give Us a Call at (714) 282-7771 Today! 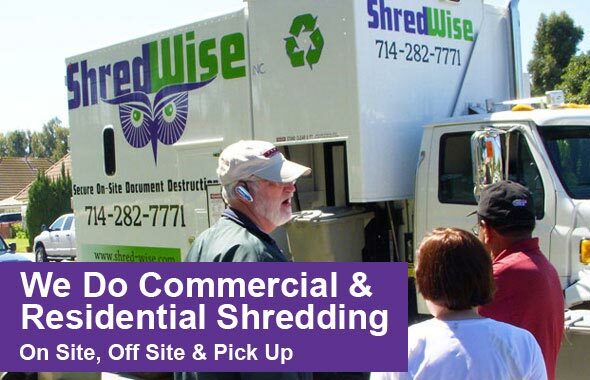 Call Shred Wise to obtain an over-the-phone quote, schedule service, or inquire about a free onsite consultation. At Shred Wise, we employ the industry’s best practices and the market’s highest quality equipment to offer exceptional on-site mobile shredding services in Cypress, Stanton & Los Alamitos. With our onsite mobile shredding services available throughout Cypress, Stanton & Los Alamitos, we are very careful to meet all of the requirements and high standards of today’s privacy legislation, including those set by HIPAA, FACTA, and GLB. To keep up with the ever-evolving and -changing privacy laws and legislation, we keep up to date with NAID and follow their extensive recommendations for secure information destruction. As such, we’ve carefully vetted our employees and make sure that they are the only ones to handle your shred bins. We use one of the best mobile shred trucks available on the market today: the Shredfast SF300. This state-of-the-art shred truck features an onboard shred camera, a shredding capacity of 6,000 pounds of paper an hour, a load capacity of up to 17,000 pounds, a fully automated lifting arm, and industrial shredders that use a pierce and tear technique to effectively destroy your documents and files. With this shredder, there is no need to remove staples, paperclips, or rubber bands; and we will perform your shredding right in front of your business or home. You are welcome to witness the shredding from the curb or by viewing our remote shred cam. Once the shredding is complete, we’ll ensure that 100% of the paper is recycled and issue a Certificate of Destruction for your records. Call today. We’ll schedule our mobile shredding services at your site as often as you need us. When used for large-scale purges, our off-site shredding service is just as convenient, secure, and cost effective as our on-site shredding service. Off-site shredding involves us dispatching one of our panel trucks to your site in Stanton and picking up your paper — whether it’s in boxes or bags. We then transport your paper back to our facility to promptly shred your documents using our mobile shred trucks. Our clients are provided a Certificate of Destruction. Additionally, we guarantee that 100% of the paper we shred off site is recycled. 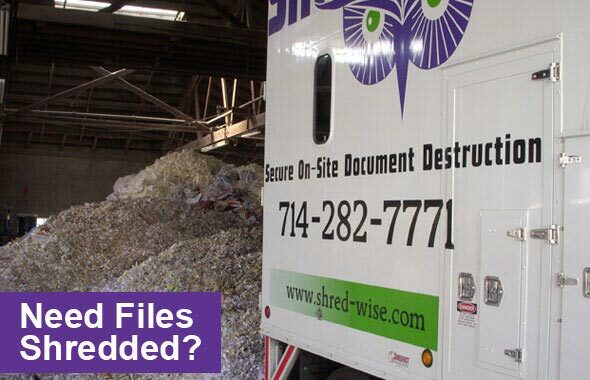 Shred Wise Inc. is the best choice for Los Alamitos, Cypress, and Stanton businesses that wish to safely and securely dispose of sensitive information, such as bank records, client lists, employee HR files, invoices, bids, proprietary information, and more. We have over eight years of experience; are licensed, bonded, and insured; and NAID-compliant. We’re also locally based and keep over 90% of our service routes in Orange County; this means that we keep our costs low and can be much more responsive than shred companies with much larger service areas. And, because our services are so affordable, flexible, efficient, and convenient, our shredding services in Los Alamitos are as cost-effective for the small two-person business as the large, multi-location corporation. Our corporate shredding services consist of one-time shredding services, ongoing scheduled shredding services, and a combination of both. The one-time shredding service is ideal for large purges and cleanouts. The ongoing scheduled shredding services are essentially simple service agreements that let you enjoy monthly, bi-monthly, weekly, bi weekly, or quarterly visits from our mobile shred truck as well as free use of our shred consoles and rolling bins to keep your documents secure in between visits. Because we know that information security is just as important to the residential customer as it is to the commercial customer, Shred Wise is proud to offer residential shredding services in Los Alamitos, Cypress, and Stanton at affordable prices. Our residential shredding services include both on-site and off-site shredding as well as our drop-off shredding service. On-site shredding is performed by our mobile shred truck right in front of your home. As long as there is enough clearance for our tall trucks, our shred trucks can drive on almost any residential streets. Our on-site mobile shredding service is usually less than most drop-off shredding services. If you need to purge a large amount of paper but don’t want all of the shredding done on site, you can request our off-site shredding service, where we will pick up your papers in a secure truck and bring them back to our facility for shredding. Call today for a free quote and to schedule shredding services in Los Alamitos, Cypress, and Stanton.